Cognitive thinking, creativity, collaboration and communication – the four Cs – are achieved only when students are involved in activities that help them learn by doing hands-on tasks. Tell me and I forget; Teach me and I remember; Involve me and I learn said Benjamin Franklin. And perhaps every teacher in their career span has tried to imbibe these wise words in their teaching methods. Cognitive thinking, creativity, collaboration and communication – the four Cs – are achieved only when students are involved in activities that help them learn by doing hands-on tasks. As a teacher, to be able to involve and engage, one is at the mercy of student data. Data on their topic-wise progress, strengths and weaknesses, confidence level of a student in a certain topic and time the spent by a student on a certain topic. Keeping a track of all this for each student is a huge task. However, good use of technology has played a vital role in making this task easier. There has been an evident shift in the approach towards quality of education in our country and data, forms the core of this shift. Use of education related data for evidence-based policy making by government bodies has increased over the years. All this was possible due to the availability of technical knowledge and software to collect and process this data in a shorter period of time. There are several different factors that affect learning outcomes of students. These factors can either be intrinsic or extrinsic in nature. A research published in 2017 by UNESCO (UNESCO. Analyzing and Utilizing Assessment Data for Better Learning Outcomes. Open Access under Attribution Share Alike. Paris. 2017) for 10 countries in Asia Pacific identifies the factors that are most influential in the learning outcome of students from these countries. One of the most crucial findings of this research shows that the major extrinsic factors contributing to the learning outcome of students in India are: School Type – Private/Government, Household Income and Spending Capacity and Parents’ Education. These factors are also monitored on a national level by specific bodies in India. The Department of Educational Management Information System (DEMIS) uses an in-house software called District Information System for Education (DISE) to manage and process data collected for various different extrinsic factors of students in various regions of India. Some examples of data collected are gender, age, social category of students, etc. along with educational and professional qualifications of teachers and infrastructure facilities in schools, etc. However one must acknowledge that the intrinsic factors are the key to developing the right learning path for each student. The assessment data of students along with their study patterns are studied and an effective personalized path of learning is delivered to the student through the education system. A vast amount of data regarding student learning behaviour needs to be collected and monitored to enable such personalized learning systems. This is where technology and education can work together to play a part in tapping the full potential of each learner. For a digital solutions provider, it is important to strike a balance between Content and Technology to make the lives of teachers easier and augment the learning experience of learners. Thanks to their hard work, teachers are no longer required to spend time reviewing each student's daily progress and scores to provide personalized instruction for the next day of class. Artificial intelligence and adaptive technology are making learning today more effective, efficient, and personalized. Artificial Intelligence enabled solutions like ALEKS, SmartBook, LearnSmart, etc. adjust content and gather data in real-time. This data provides a complete picture of students' abilities across a wide range of skill areas. Using this data it analyses specific learning needs for each student and customizes learning content. It thus empowers instructors with tools and insights to build and implement highly-customized learning experiences. Different segments of data can be made available about a student using these Artificially Intelligent systems. These segments can be categorized as: Academic Performance in terms of scores, Time spent studying – (on the platform), Topic-wise learning outcome, Actual Cognitive Understanding of a student, All these three segments can be made available in two formats – either Student-wise or as Class Average. The pie chart depicts the topic-wise class average. Every segment represents a topic and the coloured portion represents the topics mastered while the grey sections are the topics that are still to be learned. 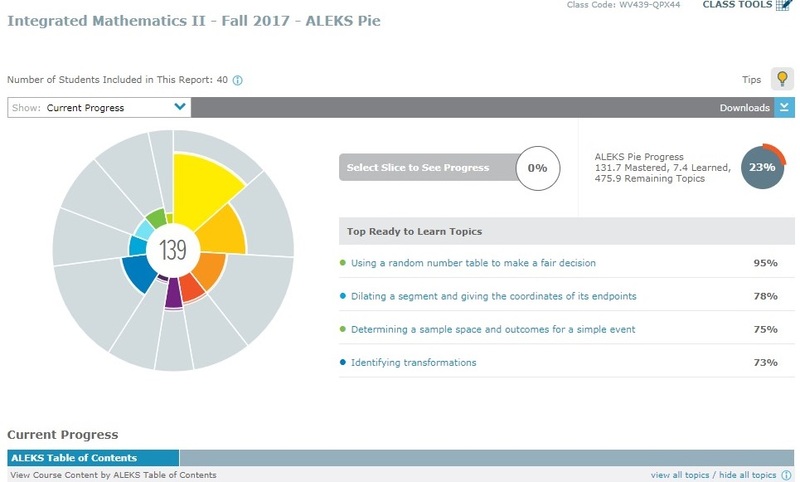 This is a dynamic graph on the platform which means that – each of the segments in the pie can be clicked on to get the deeper insight on each topic. Such an analysis helps identify the need areas of a class and pinpoints the topics that your class has mastered and those that need more attention. There are numerous scientifically proven results and case studies that show that, such data based learning solutions not only help get better grades, but also enable students to enjoy the learning experience. It allows students to learn from their mistakes and practice until they have mastered the topic without the burden of running at the pace of the classroom sessions. - Deepti Tagare is a Senior Product Developer at McGraw Hill Education responsible for owning complete product development cycle and life of digital educational products for the company.